This is the fourth section of our guide to calculating player value in fantasy football. Each part will lay out a different aspect of the process. Part I, Part II, and Part III are already up, and Part V will be published on our blog tomorrow. At the beginning of this series, I set out to project the value that each player would have given a certain ranking within his respective position. Accomplishing this would not just tell us that the top running back is valuable, but how valuable he is, relative to all of the other players. We started this calculation at the most basic unit of worth, weekly value. After we had every past player’s weekly values, we added them up to get their seasonal values, and used those to project raw seasonal values for this year’s players. I refer to these seasonal value projections as “raw” because we still need to make changes to them before we have our final draft pick valuations. As we work toward finalizing our draft values, I’ll start by explaining why we need to bother calculating draft value in the first place. Then, I’ll show you how this calculation works and the results that it produces. If we don’t make this draft replacement level adjustment, our values won’t reflect the available alternative to paying to fill out a roster slot with your draft picks or auction dollars. This alternative is the draft replacement, and subtracting his expected value tells you how many points you gain from drafting a player instead of saving your in-draft currency and streaming end-of-the-bench players and free agents in that roster spot. Now we know how and why we need to convert raw seasonal value to draft value, so it’s time to actually go about doing it. We have every player’s PAR, so to complete the formula above, we just need to calculate the Draft Replacement’s PAR. To find the draft replacement’s PAR at a given position, we add the expected PAR of the worst player drafted at that position to the expected PAR of the free agents at the position that each owner is expected to pick up. 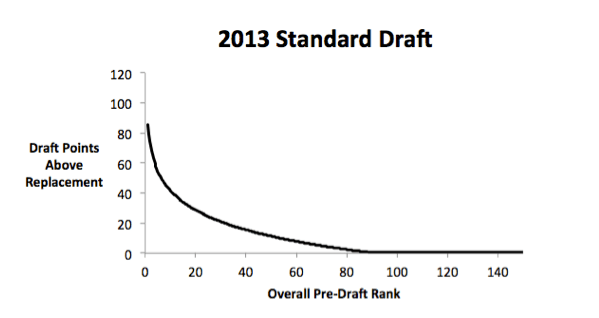 Finding the expected PAR of the worst drafted player at each position isn’t an issue; we already have this data. Calculating the amount of free agent PAR that each owner should expect at each roster slot will prove much more difficult. First, we need to find how much free agent PAR will be available to the whole league at each position during the season. Then we’ll need to somehow divvy up this free agent value appropriately among teams and their roster slots. A standard league drafts 150 players, and according to our projections, 20 QB’s, 50 RB’s, 44 WR’s, 16 TE’s, 10 K’s, and 10 DEF’s will typically make up this pool. If these are the drafted players, then any player ranked outside these positional limits in the preseason could reasonably be expected to be undrafted. We can go back over the last five years, find these undrafted players at each position and add up their individual points above replacement to find the total PAR available at each position. 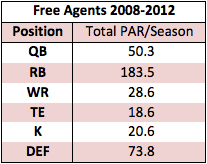 The average PAR available through free agency per season from 2008 to 2012 will serve as our reasonable expectation of the value coming in from the waiver wire this year. You notice right off the bat that most of the value that comes into fantasy leagues through free agency is at the running back position. Fantasy success at running back is more dependent on opportunity than most other positions and those opportunities constantly materialize because the position’s demands are so conducive to injury. Combine those forces with the fact that running backs are generally more valuable than other position groups, and this result isn’t too surprising. The low total for quarterbacks isn’t shocking either; elite quarterbacks rarely come out of nowhere. The Brady’s and Manning’s of the world tend to occupy those spots with a death grip year after year more so than the top guys at other positions. The lower total for wide receivers and tight ends, on the other hand, might be surprising, since random free agent-type guys at these positions put up great performances every week. Those fluky performances don’t boost the value of the free agent pool at their positions because fluky performances, by definition, are very hard to predict. Every week, a Nate Burleson or an Austin Pettis might rack up a gaudy fantasy line, but it’s almost impossible to say with confidence which of those random slot receivers will bust out for one game before it happens. If we don’t have any expectations for these guys going into the week, then we won’t start them, and they won’t be able to accrue value for our teams. This makes them relatively valueless. And that is why the free agent pools at WR and TE offer little. The same concept applies to defense and kickers in keeping their free agent value shy of what the running backs offer. We have our values for each position’s pool of free agents across the entire league, but we still need to divvy them up among roster slots. Our first intuition might be to simply divide the total PAR equally among all of the league’s 150 roster slots. This wouldn’t really make sense though. Fantasy owners can’t occupy every roster slot with a rotation of free agents; they have players that they don’t drop, players who are “locked in”. Aaron Rodgers’ owner doesn’t extract any free agent value from Rodgers’ roster spot because Rodgers is there to stay for the entire season. Owners really only pick up free agents in the roster spots of drafted players who are ineffective, and they do this because they think the free agent might offer more value than that drafted player. This rotation of free agents through a roster spot is called streaming. We want to spread the league’s available free agent value throughout these streaming spots. But how do we figure out how many roster spots will be streamed across an entire league? The model shows the value of the average roster spot’s free agent streamers increasing (in blue) and the value of the worst locked in starter decreasing (in red) as the number of spots being streamed goes up. 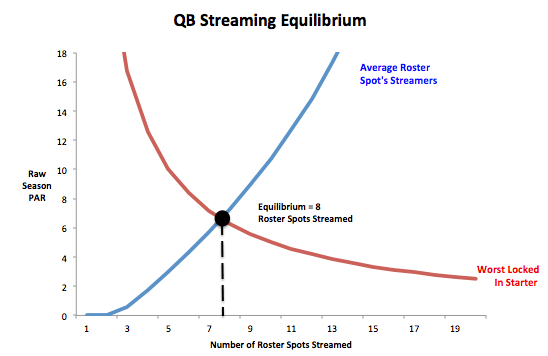 When these two values are equal, we arrive at the equilibrium point (in black) of eight streamed QB roster spots for the whole league. Each of these roster spot’s streamers have a value of 7.27 PAR. Later we’ll add this value to the PAR of the worst drafted QB to get our draft replacement. We’ll also do the same with the other positions, but first I want to address some of my concerns with this method. This model uses some simplifying assumptions. The biggest one is that streaming is binary; you stream or you don’t stream a roster spot. In reality, these are not your only two options. You could stream a roster spot for one week, two weeks, three weeks, and so on, all the way up through seventeen weeks. For example, you might have the tenth best running back, who you lock in for fourteen weeks and then stream for the other three when he is suffering from nagging injuries. This demonstrates that streaming can actually be measured on a continuous scale. The model also ignores overlap in free agent contributions. If there are 100 points available on the wire over the course of the year, the timing of that point-scoring from week to week might not line up so that your league utilizes all 100 points of value in its starting lineups. This leakage goes unaccounted for above. These assumptions, along with some more minor ones, prevent this model from being a perfect representation of reality, but it generally describes the process well and will be sufficient for our value calculations, so I feel comfortable moving on. With this model in tow, we can use our drafted player and free agent data to find the equilibrium number of streamed roster spots at the other five positions. In this table, you can see the number of standard league roster spots at each position that would be streamed and the number that would be locked in. Quarterbacks, for example, have 13 roster spots locked in and 7 streamed, with the fourteenth drafted player projected to be no better than a rotating cast of free agents. While all of the projected starters and the top few bench players at QB, RB, WR, and TE are locked in, kicker and defense are almost entirely streamed. Even though the league starts ten K and DEF each, only the top three or four project to outperform a free agent rotation because it is so easy to play the matchups at these positions. This is a concept that most serious fantasy players understand; this method just backs up the intuition with data so that we can incorporate it into our value calculation. Next, we’ll convert these draft values into auction prices and discuss draft, auction, and trade strategy. We’ll also compare our findings to what you would get from ESPN’s player values to see how all this new information should change your approach to fantasy football from the standard ESPN model. Part V will tackle these topics as we wrap up our series. Thanks for reading guys- looking forward to seeing all six of our remaining followers (my mom, my dad, my sister, my grandma1, and two unknown wildcards who just have an incredible fantasy football word count tolerance) at the fateful conclusion of the Fantasy Value Handbook. 1Since family are kind of obligated to [allegedly] read, I guess they don’t really get to be part of the fan tally. I’m counting on you Wildcard Guy #1 and Wildcard Guy #2. So the bit about part V was a joke, then?